Grant that your faithful, O Lord, we pray, may be so conformed to the paschal observances, that the bodily discipline now solemnly begun may bear fruit in the souls of all. Through our Lord Jesus Christ, your Son, who lives and reigns with you in the unity of the Holy Spirit, one God, for ever and ever. According to the 1962 Missal of St. John XXIII the Extraordinary Form of the Roman Rite, today is the feast of St. Gabriel of Our Lady of Sorrows who was born in Assisi on March 1, 1838, the eleventh child of Sante Possenti and Agnes Frisciotti. His father Sante was a distinguished Italian lawyer. The boy was given the name of the city's illustrious patron, St. Francis, at baptism. Historically today is the feast of St. Leander of Seville, brother of St. Isidore of Seville, who was the Bishop of Seville instrumental in effecting the conversion to Catholicism of the Visigothic kings Hermengild and Reccared of Hispania (the Iberian Peninsula, comprising both modern Spain and Portugal). Today is the first of the traditionally observed Ember Friday of the Spring Ember Days. There are two principal objects for the Ember Days of this period of the year: the first is to publicly offer thanks to God the season of Spring, and secondly to ask God to bless the fruits of the earth and human labor. A third traditional focus of the Ember Days is to ask Him to enrich with His choicest graces the priests and sacred ministers particularly those who might be ordained on the upcoming Ember Saturday. On Ascension Day, 1920, Pope Benedict XV bestowed the honors of sainthood on a youth who is rightly called the Aloysius of the 19th century. He was Francis Possenti, known in religion as Gabriel of the Sorrowful Mother. Born in Assisi, March 1, 1838, he was given the name of the city's illustrious patron, St. Francis, at baptism. As a student in neighboring Spoleto, he led a good though rather worldly kind of life until God drew him closer to Himself through an illness. The decisive step was taken while seeing the highly honored miraculous picture of our Lady in Spoleto borne about in solemn procession. As his eyes followed our Blessed Mother, Francis felt the fire of divine love rising in his heart and almost at once made the resolve to join the Passionists, a religious congregation dedicated to the veneration of and meditation on the passion of Jesus Christ (1856). After overcoming many difficulties, he carried out his resolution and received the religious name, Gabriel of the Mother of Sorrows. Even as a novice, he was regarded as a model of perfect holiness both within and beyond the cloister. Saint Gabriel did not stand out from his community in any extraordinary way — his heroism lay in his obedient attitude. He conformed himself to his community in complete humility. Little is known of his life - only that he was blessed with an excellent memory and other gifts that made him an outstanding student. He also had a great devotion to the Passion of Christ and the Sorrows of Mary. Pius X and Leo XIII especially desired that he be the patron saint of young people and novices in religious orders, as their model in the interior life. He died in the year 1862. 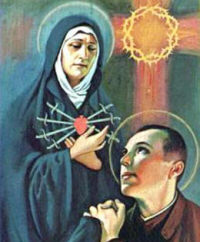 Saint Gabriel Possenti wrote: "Love Mary!... She is loveable, faithful, constant. She will never let herself be outdone in love, but will ever remain supreme. If you are in danger, she will hasten to free you. If you are troubled, she will console you. If you are sick, she will bring you relief. If you are in need, she will help you. She does not look to see what kind of person you have been. She simply comes to a heart that wants to love her. She comes quickly and opens her merciful heart to you, embraces you and consoles and serves you. She will even be at hand to accompany you on the trip to eternity." Patron: Abruzzi region of Italy; Catholic Action; clerics; students; young people in general. St. Leander was born of an illustrious family at Carthagena in Spain. He was the eldest of five brothers, several of whom are numbered among the Saints. He entered into a monastery very young, where he lived many years and attained to an eminent degree of virtue and sacred learning. These qualities occasioned his being promoted to the see of Seville; but his change of condition made little or no alteration in his method of life, though it brought on him a great increase of care and solicitude. Spain at that time was in possession of the Visigoths. These Goths, being infected with Arianism, established this heresy wherever they came; so that when St. Leander was made bishop it had reigned in Spain a hundred years. This was his great affliction; however, by his prayers to God, and by his most zealous and unwearied endeavors, he became the happy instrument of the conversion of that nation to the Catholic faith. Having converted, among others, Hermenegild, the king's eldest son and heir apparent, Leander was banished by King Leovigild. This pious prince was put to death by his unnatural father, the year following, for refusing to receive Communion from the hands of an Arian bishop. But, touched with remorse not long after, the king recalled our Saint; and falling sick and finding himself past hopes of recovery, he sent for St. Leander, and recommended to him his son Recared. This son, by listening to St. Leander, soon became a Catholic, and finally converted the whole nation of the Visigoths. He was no less successful with respect to the Suevi, a people of Spain, whom his father Leovigild had perverted. St. Leander was no less zealous in the reformation of manners than in restoring the purity of faith; and he planted the seeds of that zeal and fervor which afterwards produced so many martyrs and Saints. This holy doctor of Spain died about the year 596, on the 27th of February, as Mabillon proves from his epitaph. The Church of Seville has been a metropolitan see ever since the third century. The cathedral is the most magnificent, both as to structure and ornament, of any in all Spain.